Today we are featuring a guest post by Scott Jenkins on the subject of community gardens, and the myriad benefits they can provide to a neighborhood, town or city. The idea of a community garden isn’t a new one. Long before urban and suburban dwellers started pitching up balcony herb gardens, people found that coming together to plant hope in the ground was a pretty good thing. Now, when modern life seems to be more stressful and uncertain than ever, community gardens could prove to be the salve that heals our hurting communities. We all have to eat. It’s biology at its most basic—if you don’t feed your body, it won’t function. Modern civilization has solved a lot of problems, but we still haven’t managed to eliminate food deserts in first world countries. With the cost of living ever on the rise, food prices also go up. The cost of transporting fresh foods across the country, coupled with a shortage of workers to pick and process the foods, means the average family struggles to put fresh food on the table. Communities that rely on cheap, processed foods see a higher incidence of health problems, such as diabetes, obesity, and heart disease, which can lead to a greater financial burden not only for the families, but for the community at large. Unhealthy people miss work, miss school, and miss out on a better quality of life. Gardening can provide the fresh foods that people need, but individual gardens won’t work for everyone, especially in urban areas. Not everyone has access to a plot of land for gardening, but most communities, even urban ones, do have plots of land sitting empty. These plots, which are often eyesores that detract from the overall aesthetic and value of a community, could be put to much better use as community gardens. First, looking at community gardens through the lens of property value, an empty plot has less value than one that’s being devoted to something useful. And research shows green spaces can have a positive impact on surrounding property values, if the green spaces are properly maintained and well-kept. Consider property values of properties located near community parks and recreation areas. Property value goes up when there’s an attractive green space nearby, such as a park or garden. Even small strips of greenway running between properties have shown to improve property values in urban areas. Of course, there’s also the perceived value of a community garden that’s been placed in an unused piece of land. Ask most residents of a community which they’d prefer: an empty eyesore or another slab of parking spaces, versus a lush, verdant community garden that will provide nutrition and sustenance to the entire community? Most people agree that gardens are preferable to vacant lots, especially if the gardens are well-kept, well-illuminated, and useful. With this in mind, a community garden can actually increase the security and safety in the immediate area. Whereas vacant lots can be magnets for crime, well-monitored community gardens offer no place for crime to flourish. Residents can reclaim a sense of physical security along with their sense of food security. They may even turn a new generation onto gardening. By giving kids and teens the tools they need to grow their own food, they’re not only steering them away from trouble, but they could be giving them the keys to their own financial futures, too. A 2012 study at the University of Pennsylvania found evidence that greening vacant lots in Philadelphia with a park or community garden may reduce crime in the area immediately surrounding the lot. The research showed that the number of crimes reported to police may have been reduced after the lots were planted with vegetation and that residents living near the lots overwhelmingly reported feeling safer. In addition to the potential increase in surrounding property values and public safety, community gardens foster an increase in community engagement and interaction. People working together towards a common goal, neighbors getting to know each other better, people given an opportunity to develop a healthy hobby—all these raise spirits in the community. Community gardens provide a hub for residents of all ages to come together and create something that’s useful and beneficial to everyone. They offer a boost for mental health, too. Besides the therapeutic act of getting your hands dirty in the soil, there’s the knowledge that you’re contributing to the success of your community by growing food that will feed its residents and put more money in their pockets. Food insecurity is financial insecurity, after all. The two are too intrinsically linked to separate, and community gardens help eradicate both problems. 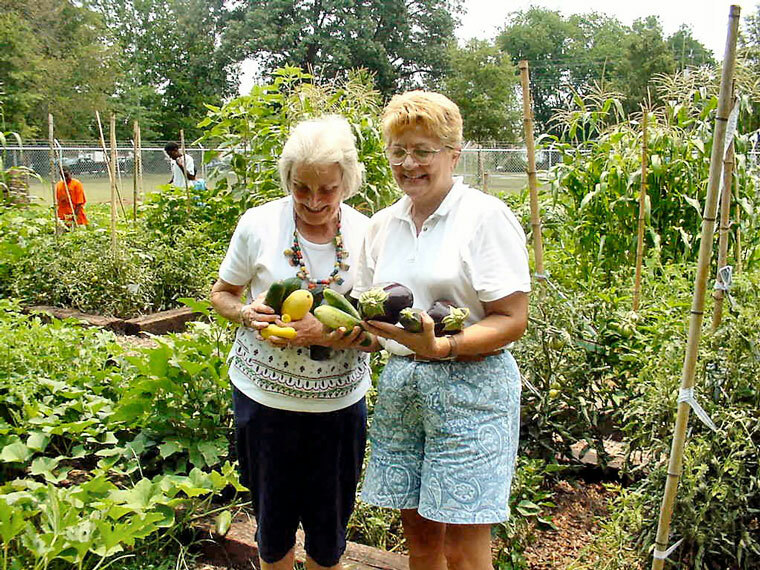 Financially, a community garden is so much more than just a source of food for its residents. While growing your own food does put more money back into your pocket, if you grow more than you need, you can sell the excess. Organic produce is in high demand. A well-placed farmer’s market or produce placed in local supermarkets could yield a big return for a successful community garden. The money made from selling excess produce can be funneled back into the community so it benefits everyone, not just big box supermarkets and corporations. The Detroit Black Community Food Security Network (DBCFSN) operates a seven acre non-profit community garden that sells its produce at its own farmstand and at local farmers markets. To date, they have donated $67,231 dollars back into the local community and have taught countless local children between the age of 5 and 12 how to grow their own food. A community garden is, at its most basic, a tool to put control back in the hands of residents. By using urban land to produce nutritious food, residents who establish a garden can positively impact property values and neighborhood security. Growing food in the city can also help people take control of their health and improve their finances by reducing illness and improving overall health. Having a sense of control over even this one aspect of your life can have great benefits to mental health. Community gardens can bring back a sense of pride to communities that have long felt overlooked and helpless. That’s a benefit that’s impossible to measure but difficult to ignore. Community gardens aren’t a new phenomenon, but they seem to be more relevant than ever. During World War I and World War II, people in the United States, Great Britain, Canada, and Australia devoted themselves to Victory Gardens, a type of community garden designed to empower citizens by encouraging them to grow their own food. This food was used for both private consumption and in the greater community to help alleviate food insecurity. Victory Gardens appealed to residents in an emotional and a practical way. The common sense approach allowed regular citizens to maintain a sense of control over their own health and finances back at home. With few negatives and many benefits, community gardens are definitely a way to work toward building strong towns and cities. By taking control of the foods we grow, eat, and sell, we can strengthen our communities from the ground up, one garden at a time. Scott Jenkins holds a degree in Architectural Engineering and is always trying to learn more about building sustainable homes. His wife keeps him busy around the house, and their two kids keep life interesting every day. He spends a lot of time writing when everyone else in the house is asleep and riding his bicycle or reading a book on his Kindle when the house is empty. In addition to Scott's contributions to Strong Towns, he is a regular writer for his wife’s website Architypes. You can also follow Scott on Twitter.